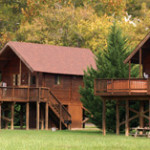 The Angler, Drifter and Paddler Log Cabins are on 7 acres of Shenandoah River front acreage — for the country experience! Seventeen miles from Luray — where the Stars shine bright! 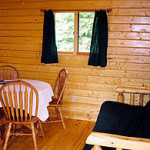 Each of these cabins have a queen-bed bedroom with a ‘propane fireplace’, a mini-kitchen, shower stall bathroom; a living room with a double-bed futon; and a loft area with a double-bed. 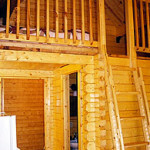 Each cabin is set up to sleep 6 max. 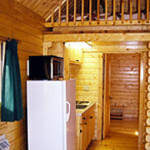 The mini-kitchen has 2 stove top burners, sink, microwave, toaster, coffee pot and refrigerator (no oven). All the dishes and pots you will need are here. 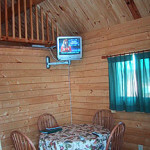 The cabins have heat/AC and Direct TV. There is a 5-person hot tubs on the decks of Drifter and Paddler cabins. The hot tub for the Angler cabin is in a private Gazebo. 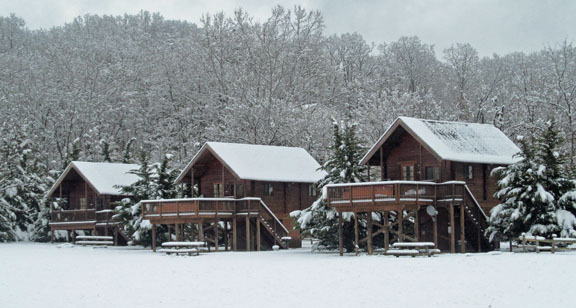 There is a picnic table, charcoal grill and fire pit for each cabin. The Shenandoah River is just behind the tree line down from the cabins. You can easily walk to the river or drive down the driveway on the other side of the meadow. 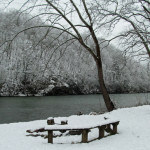 At the river, there is a picnic area, fire pit and easy access to the river for canoeing, fishing and swimming. The River Lure is our new cabin on this 7 acres. It has larger space (still sleeps 6), a propane fireplace and a full kitchen. Click for more information and photos. 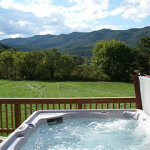 Renting all 4 cabins provide a great place for family reunions, business retreats or a gathering of friends! With 6 in each cabin, you can have up to 24. 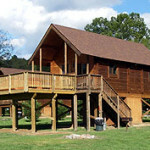 These cabins are located about 17 miles from Luray VA and about 7 miles of gravel road pass the Shenandoah River Outfitters Store. The setting is one of woods, fields, mountain views and the banks of the Shenandoah River for great fly & bass fishing and just playing in the river. 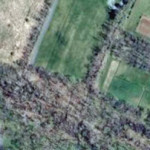 Just up the gravel road is access to George Washington National Forest for hiking, bird and animal watching. Here is a list of hikes in the area. We have a lock box on the door of each cabin. When paid in full, you get the code and can go directly to the cabin. 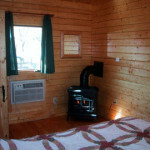 The Angler, Drifter and Paddler cabins are ‘pet friendly’ and ‘smoke-free’. No camping at cabins or at river is allowed. Max. of 6 in each cabin. Each additional person will be charged $100/person/night. Check rates here and Availability below. 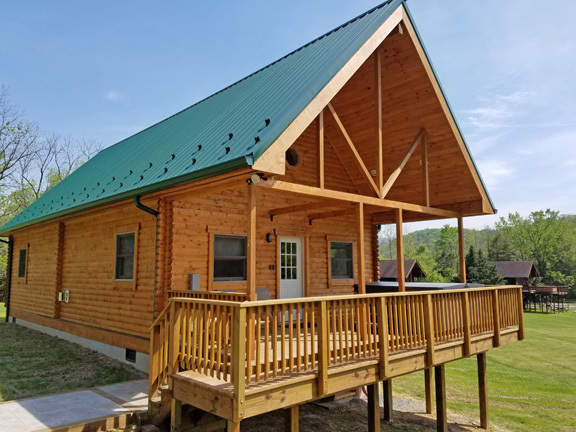 You can reserve online for the Angler, Drifter and Paddler cabins or Call in to 540-743-4159 to book between 9 and 5 each day! Weekend away in great little cabin–Between all the hard work we do, and the holidays, my boyfriend and I needed some time to disconnect from work and reconnect with each other. The paddler cabin was perfect for us. Cozy and comfy, we had all we needed to cook fun meals for each other, watch silly TV on Dish TV, gaze at a barely believable number of stars from the hot tub on the deck, and say hello to some lovely woodland creatures who walked by on their way to the river. I left thinking about when we can plan to come back!